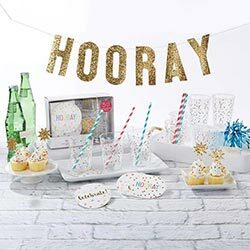 Our Kate Aspen Hooray 50 Piece Party in a Box set is just the versatile party set to relieve some of that decorating stress! 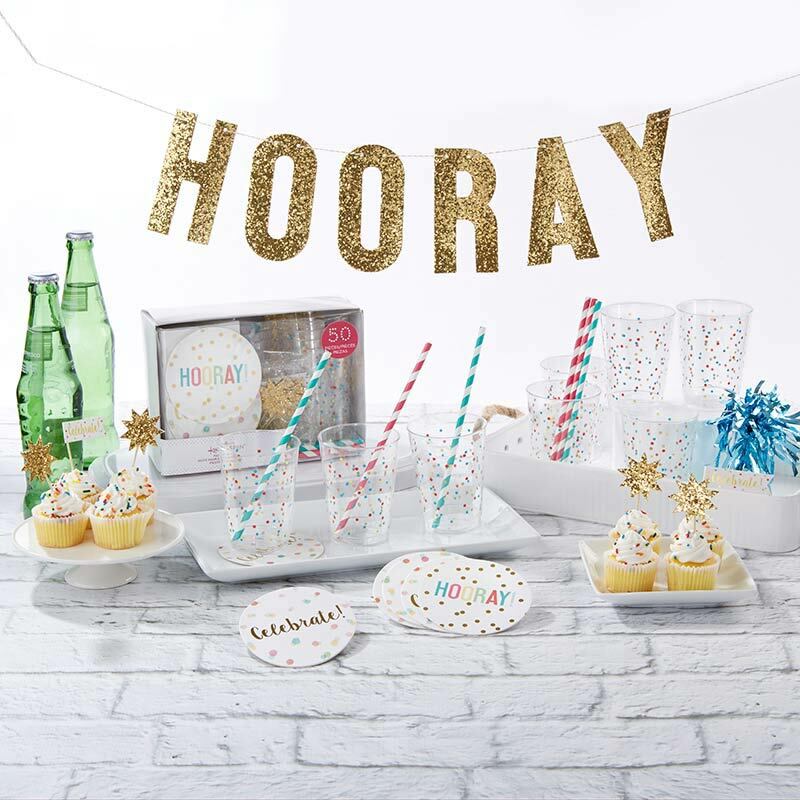 The complete kit includes 1 banner, 25 straws, 8 cups, 8 decorative picks, and 8 coasters, all in a gold, red, blue, yellow, green, and pink party theme. 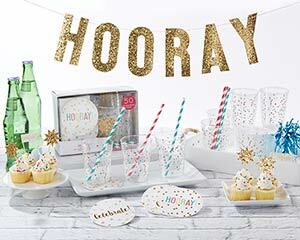 Made from cardstock and plastic, this is a kit that is ready to usher in a good time! 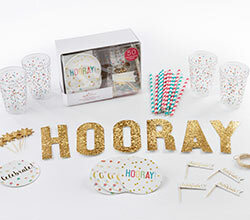 Gold glitter "Hooray" banner, pink and white striped straws, blue and white striped straws, clear plastic cups with gold, red, and blue confetti, white banner decorative pick spelling out celebrate in gold foil, gold glitter starburst decorative pick, white coaster with gold foil dots and ""Hooray!"" spelled out in red, blue, yellow, green and pink, white coasters with red, blue, yellow, green and pink watercolor dots and ""Celebrate!"" in gold foil. Banner measures 41.33"" w x 4.96 ""h x 0.07"" d, straw measures 7.67"" h x 0.27"" d, Cup measures 3.81"" h x 2.91"" d, Banner decorative pick measures 2.36"" w x 2.51"" h x 0.07"" d, Starburst decorative pick measures 1.65"" w x 3.07"" h x 0.07"" d, Coaster measures 0.03"" h x 3.70"" d. Retail ready kit measures 8.26"" w x 5.70"" h x 3.54"" d.
Made from cardstock and plastic.